Stop Moose'n Around and reserve this charming cabin for your next mountain getaway! 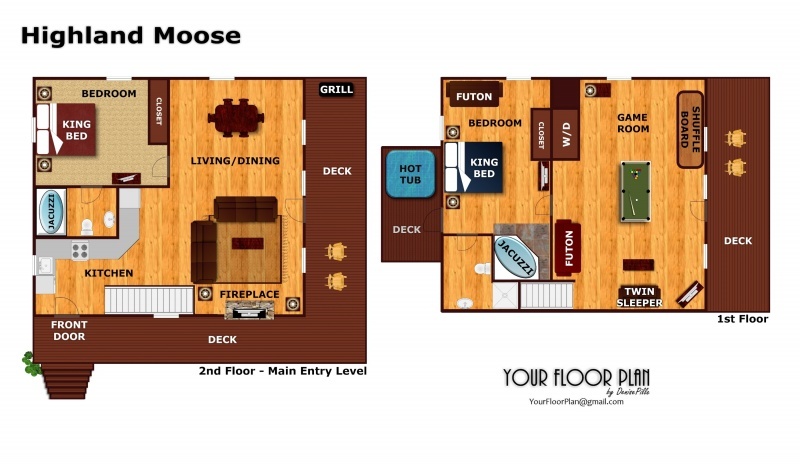 HIGHLAND MOOSE is a two bedroom two bath real log cabin with 2 King master suites - each with their own attached bath. This cabin is perfect for both families and two couples traveling together! Futons and a sleeper sofa provide space for extra guests allowing up to 9 visitors to enjoy the cabin! Conveniently located just outside Pigeon Forge in the scenic Walden's Creek area, and inside the gated Shagbark community - HIGHLAND MOOSE is just short gallop back to all the shopping, dining, and attractions in town. Dine out or grill in! You'll want to stop by the grocery to take advantage of the full kitchen. The real stone/wood fireplace is perfect for snuggling up to watch your favorite movie. Then shoot some pool, or throw on your swimsuit to enjoy the bubbling hot tub or community pool! You won't want to miss HIGHLAND MOOSE. Call today! Only set back was the Butane bottle for grill was empty so we had to have it filled while we were there. I would suggest that the housekeeper check after each guest leaves.